The images included in this set are Adelie, Fiordland, Yellow Eyed, Magellanic, African, Royal, Snares, Jackass and Humboldt. Also included is a bonus snow/ice background for penguins living in that habitat. *Please note that the words shown on the cover page are not included in the graphics. 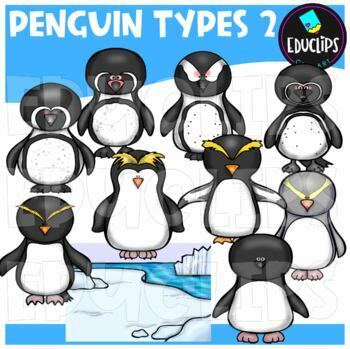 They are to show the types of penguins included.